He didn’t give her a chance to answer her own question. Covering her hand with his, he twisted the knob. The door opened with a quiet snick. 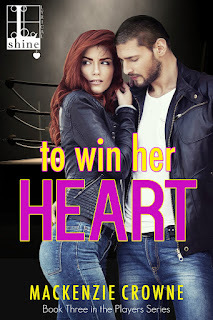 Her eyes popped open and she bit her lip against a guilty whimper. At the far end of the open floor plan, the kitchen teemed with familiar faces, several of whom looked their way. Tuck’s dirty blond brows arched to his hairline as his gaze zeroed in on her and Max. “Too late now. It’s show time.” Max’s deep whisper tickled her ear. Before she could respond, he used the hand on her lower back to turn her. As he lowered his head toward hers, she slapped a hand to his chest. “What are you doing?” The shocked demand came out in a quiet squeak. Her stiffened arm did her little good. He drew her closer. Her world tumbled as he covered her mouth with his. Stunned pleasure liquefied her limbs. With her fingers clenched in the soft material of his sweater, she held on for dear life. The animal heat of his body swirled around her and seeped into her tingling skin as his mouth introduced her to his taste and scent. Spicy man and power. An intoxicating combination. No simple peck on the lips, this. His tongue swept the seam of her mouth. Helpless to resist, she complied. Opening her lips to welcome him inside, she savored the rich combination of heat and silk as his tongue tangled with hers in a sensual dance. A willing moan gurgled in her throat as he pulled her tight against the muscular frame that had starred in countless of her fantasies over the years. If his plan was to put on a show for the family, he did one hell of a bang up-job. Talk about an Oscar worthy performance. She willingly stepped into the role of supporting actress. Wife, mother and really young grandmother, Mackenzie lives with her high school sweet heart husband, a neurotic Pomeranian, and a blind cat. She calls Phoenix home because the southwest feeds her soul. Though her friends claim she’s a princess, she disagrees. After all, one can’t raise two rambunctious boys to wonderful men without getting a little dirt under their nails. 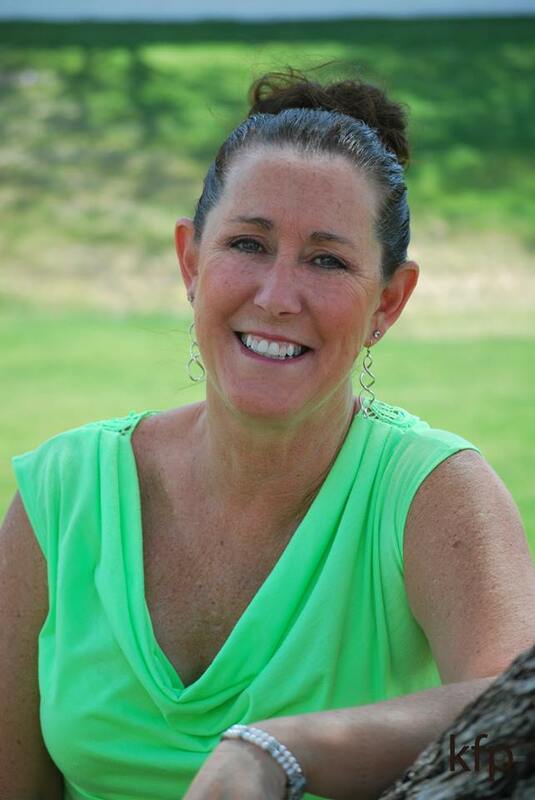 A lover of the romance genre, her resolve to share her stories with others was sharpened by a bout with breast cancer. Today she is an award-winning author and eight year survivor, living the dream. Her friends call her Mac. She hopes you will, too. Connect with her at http://mackenziecrowne.com, FB, and Twitter. I wrote urban fantasies before I tried my hand at romance. I liked them because the female protagonist is always kickass. She fights her own battles. When she meets the male protagonist, the love interest, he has to be her equal, or she doesn’t respect him. She doesn’t even need him. But she’s always his equal, too. He doesn’t surpass her. They might have different strengths and skills, but they balance each other out. Therefore, when I started writing COOKING UP TROUBLE, I thought it would be fun to write about a female protagonist who repeatedly rescues the man who’s moved in next door. Not that Ian’s weak. He has mad skills, but not many of them relate to country living. He worked in finances in New York before he bought the property next to Tessa’s to make into a resort. He knows business. He doesn’t know how to change a tire. And even though Tessa rushes to his aid over and over again, while she’s helping him, he’s helping her. He recognizes her fears. He understands that she’s guarding her heart so that it doesn’t get broken again. She teaches him practical skills. He teaches her how to mend. Equals who complement each other. Tessa Lawrence swore off men when she found her fiancée in the arms of another woman. These days, she concentrates on caring for her small farm and running a bakery and farm stand out of its barn. Ian McGregor moves to Mill Pond to build a resort on the property next to Tessa’s. Tessa’s fine with that. Mill Pond’s trying to attract more tourists. The problem is, Ian understands business, but he’s never changed a tire or pounded a nail. She finds herself helping him more than she expected, and spending time around Ian is a dangerous proposition. The man’s far too good-looking and fun to be around. 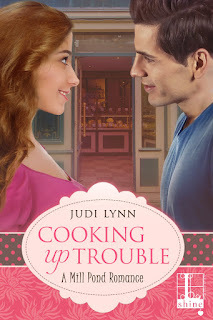 Judi Lynn Bio: When some people think of Indiana, they think of corn—which we have a lot of. But to me, Indiana is green—lush, beautiful, vibrant greens—so I use fictional towns and plunk them in an Indiana setting for a lot of my stories. I love cooking and gardening, and those sneak into my novels, too. I’ve collected more strays than I deserve. I’m a fan of Agatha Christie and urban fantasy, and I believe in happy ever after. 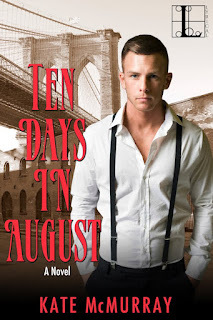 Ten Days in August features a character named Nicky—short for Nicholas—who is a female impersonator. We think of drag queens as being a fairly modern invention, but performers subverting gender have been around for generations. And it wasn’t just men dressing as women in early productions of Shakespeare plays. Nicky is loosely based on a few men I read about in a history of New York City in the nineteenth century, performers who risked a lot for their art, including getting arrested or violence. If you’ve ever walked along the Bowery in New York City, even in these modern times after it’s largely been cleaned up, it’s not hard to imagine its seedier past. Ten Days is set in 1896, when the Bowery was populated by less reputable clubs and dance halls and brothels. A few notorious clubs catered to a clientele of men who sought the company of other men. Although Nicky dances at a fictional club, there were many just like it. A lot of these places were right near where CBGB’s used to be. It is also true that the businesses in this neighborhood peddled in exactly the sort of vice Police Commissioner Theodore Roosevelt wanted to clean up. Part of how it came to thrive was police corruption—business owners paid officers to look the other way. Roosevelt wanted to crack down on crime by cracking down on corruption, and he started weeding corrupt officers out of his police department. Corruption could mean anything from accepting bribes to committing adultery. It is in this environment that Inspector Hank Brandt investigates a murder at Nicky’s club. When Hank starts falling for Nicky, his whole career is at stake. I found it really fascinating to research and write about these parts of New York history that we don’t talk about much anymore. Most people know about Ellis Island—opened just a few years before the novel takes place—and Central Park and the Empire State Building, but fewer know about this era in history. Hopefully readers find it as interesting as I do. Nowadays, acting in the movies or on TV is a glamor job, the one most of us daydreamed about when we were teenagers. Money, fame, beautiful clothes and mansions – wouldn’t it be lovely? Our parents would be proud of us for doing so well. Our friends would envy us. Not so in the early 1900s, when silent film was a brand-new industry, an offshoot in America of the all-important live theater. Even though most American enjoyed going to the theater, the people who made the plays possible were looked down upon. It wasn’t an honest job, acting, pretending to be someone else up on stage. And the morals those people had! Everyone knew that the women in particular were “loose”, prone to drinking, illicit love affairs, and heaven knows what else! As for the movies, as the people who put together silent films were known, they were probably worse, up at all hours of the night, travelling around on trains unlike respectable people! 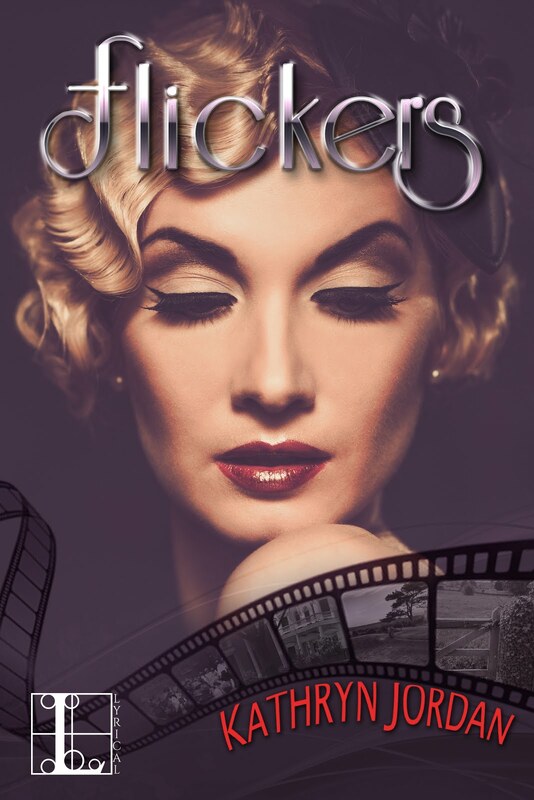 In 1916, one of my characters, Tip Rediston, is making something of a name for himself as a leading man in the flickers. When he’s offered a regular contract, his mother in particular is furious. She does her best to talk him out of it and when she fails, tries to drag his older brother into the argument. Maury stared, speechless. Never had he heard his mother use such language. Kathryn Jordan lives in the San Francisco Bay Area with her husband, two cats, and a vagrant skunk. Although she spent her childhood in a Great Lakes industrial city, she became a confirmed Californian at age nine, when her family relocated to Santa Barbara, the “Santa Luisa” of the novel. All it took was one winter without five feet of snow turning into black urban slush to convince her that the move had been worthwhile. 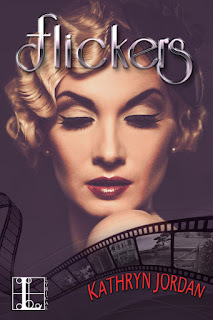 FLICKERS, her first historical novel, is a new departure for her career. Under the name of Katharine Kerr, she’s also the author of the Nola O’Grady series of light-hearted urban fantasy novels.